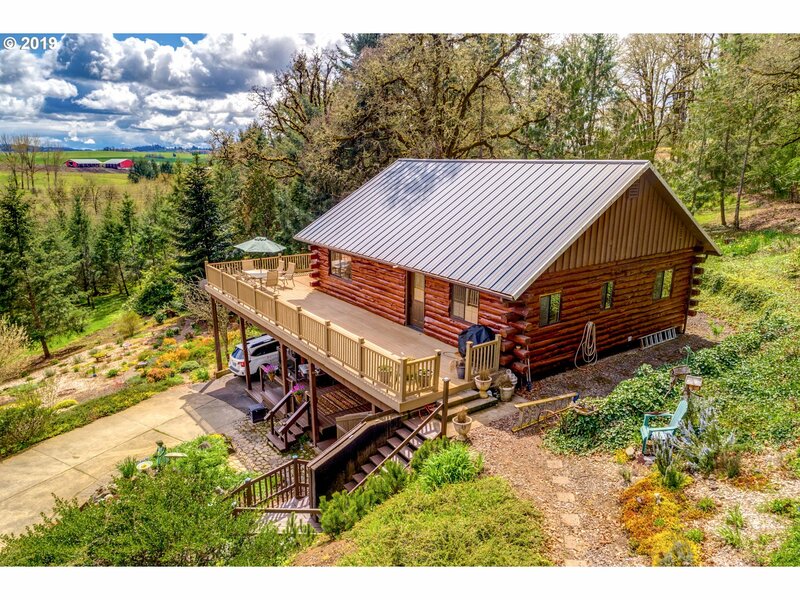 All Yamhill homes currently listed for sale in Yamhill as of 04/25/2019 are shown below. You can change the search criteria at any time by pressing the 'Change Search' button below. If you have any questions or you would like more information about any Yamhill homes for sale or other Yamhill real estate, please contact us and one of our knowledgeable Yamhill REALTORS® would be pleased to assist you. "Your 40-Acre Oregon Wine Country Retreat Awaits! Emerick Architects flagship project lovingly blt in 2002 by Hammer & Hand, this home possesses craftsmanship that is hard to find these days. Dreamworthy hm w/lush grounds, 1918 renovated barn, vineyard prepped & ready to plant (approx 5 ac). Fabulous meets function in chef kitchen that opens to dining & living rms; unadulterated westerly view goes on forever!" "Perched on a hill overlooking the Willamette Valley, this beautiful estate is a pvt sanctuary offering views from every window. Trad floorplan w/merbau flrs. 2 FP. Unlimited potential! Suitable for vineyard (40ac per soil study), horses, or current use w/60ac hay, 3000 Xmas trees & 1ac lavender. Large cedar barn w/loft could be ADU or office w/full bath, heat, 220 power, own well & septic on sep tax lot. Gated entry. A must see!" "Stunning vista views encompass this almost 100 acre estate complete with mature landscaping, natural ponds, riding trails, 2 homes & Premier Equestrian facilities!Functionality and thoughtful layout w/ attention to detail across 3 stables, indoor arena, pastures and multiple outbuildings.Clean & cozy home welcomes you to relax on the front porch and take in all the beauty.Excellent retreat,possible wine destination or boarding facility." "Prime vineyard property opportunity offering 46 acres of rolling hills in the desired Yamhill-Carlton AVA. The elegant Mediterranean style home is perched on top of this SE facing acreage offering breathtaking views. With 2.3 acres already planted in Pinot Noir & producing fantastic wine this vineyard is prime for expansion. Second home onsite is ideal for vineyard manager or guests. The outbuilding is 3,341 sq ft with concrete floor." "Opportunity knocks. Just under 15 acres gross vineyard planted + around 5 additional plantable on 40 acre parcel. Custom home ready for your personal touches, large shop + equipment shed to boot. Roughly 11.75 acres in Pinot Noir (clones 113, 115, 777, Pommard and Wadenswil), 2.5 acres Pinot Gris and around a half acre of 108 Chardonnay. Approx. 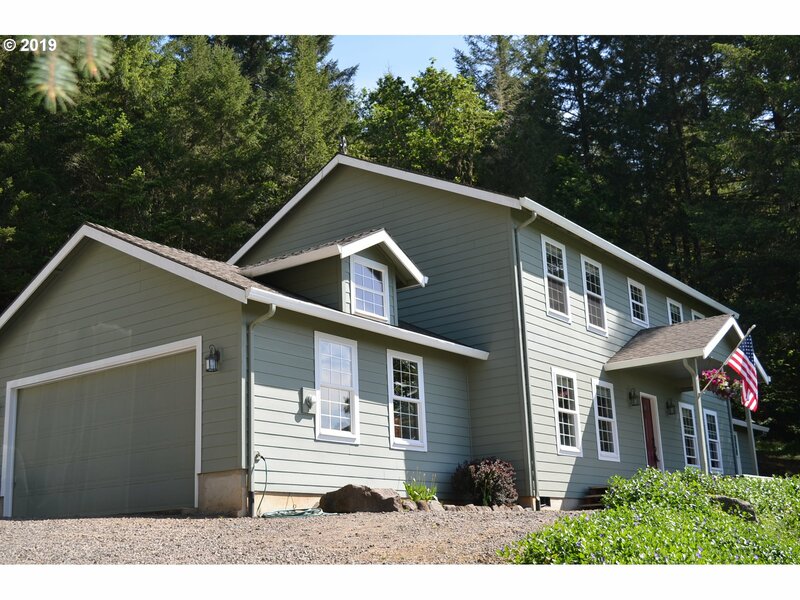 400'-600' elevation with south-southwest aspect, Yamhill-Carlton AVA, cool marine breeze." "Luxurious log cabin nestled on approx 18.5 private acres in the lush Yamhill countryside. Beautifully crafted rustic charm with modern amenities. 5 master suites, each with their own private bath. 2 full kitchens & laundry rooms on each level. Main level open floor plan is perfect for entertaining & features soaring ceilings & a beautiful stone fireplace. Views of Mt. Hood, Mt. St. Helens & Mt. Ranier. Large shop for storage or hobbies." "A custom-built, contemporary home located in the heart of Yamhill's Wine Country. 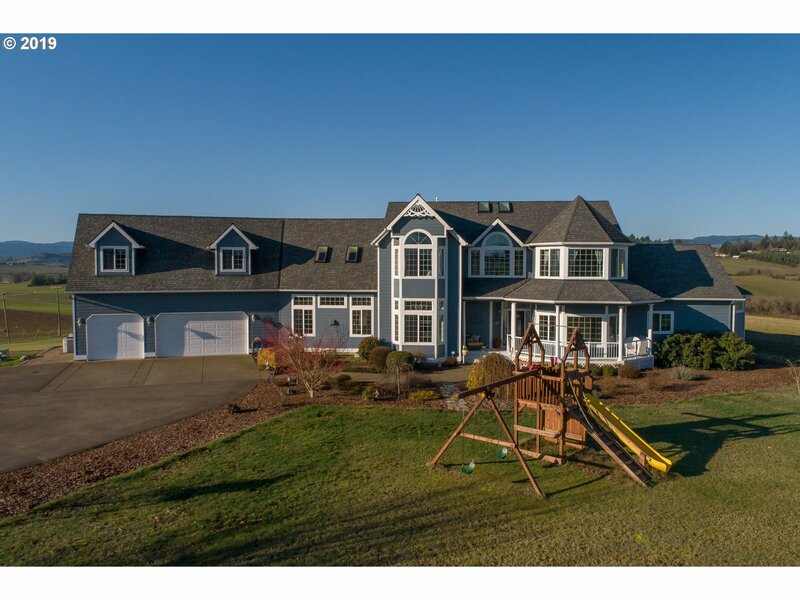 A beautiful home possessing an open-concept interior and surrounded by 7.01 acres of Oregon land. Lustrous Brazillian cherry hardwood floors cover all throughout this 6-bedroom and 4-bathroom home and abundant high ceilings set an airy tone to this home. Many local wineries and tasting rooms are located nearby, a great home to enjoy Oregon's Wine Country." "OPEN HOUSE SUNDAY 4/28 FROM 11 TO 2! Beautifully updated modern farmhouse on over 8 acres in the heart of Oregon Wine Country. Completely remodeled kitchen with SS appliances, Corian countertops and stunning cabinetry. New flooring on main level. New roof installed in 2008. New furnace/heat pump. Fresh interior and exterior paint. Multiple outbuildings including two pole barns (one 60' x 40'). 99% usable land. RV parking w/plug-in." "Gorgeous, peaceful & serene valley location w/Southern exposure. 81.75 acres, (2)dwellings, 40x96 Stock barn. Soil test available. Come build your dream home with gorgeous Southern Valley views, enjoy the herds of Elk, build your dream B&B, start a vineyard w/tasting room! opportunities abound with this special Yamhill Valley Gem!" "The possibilities are endless...farming, winery, horses, car hobby! Zoned EF-20 with 3 natural ponds on site. This home has been extensively remodeled w/high end finishes & stainless appliances. NEW garage/shop with 3 separate bays each heated separately, I extra lg. garage door for possible RV, cooled wine storage rm. & bathroom. Easy access to main hwys & High tech!" "Charming estate on 20ac! Tons of storage throughout w/South facing passive solar keeps house awash in natural light. Create your own vintage from 1ac Pinot Noir & Chardonnay vineyard w/~10-12ac vineyard potential. Acreage, gardens, apple & pear trees provide plentiful bounty. Private, idyllic setting takes advantage of valley views, perfect for stargazing & wildlife viewing from extensive deck. Easy commute to Hillsboro/Portland Metro!" "Wine Country Property!Only 5 miles from Yamhill. Close-In! 2005 Custom Home 3.5 Acres with 5 Bed, 3 Ba and 2520 SF. Master on Main. 20GPM Well.You Will Love the Updates & Large Kitchen with S/S Appliances. 2 Hot Water Heaters. RV Parking, Barn, Outdoor Basketball Court. Wonderful 45x30 Shop with Hardi-plank Siding, 220v & Concrete Floor." "Meticulously maintained two-story log home! You will love watching the sunrise over the eastern hills of the Yamhill Valley from your upper deck that wraps around two sides. Plus 31x37 double bay shop that includes a car lift with insulated workshop and upper office space. The shop can be accessed from either driveway and is complete with an added 14x31 covered RV Parking. Click VTour for more pictures and a list of over 40 details!" "Spacious 1920's home w/3 Bed 2 Full-Bath and an attached income producing 1 Bed 1 Bath apartment. Home is situated on a nice corner lot. Massive potential with unfinished basement and loft space. All mechanical systems have been updated. Huge fenced yard w/fruit trees, raised flower beds, & play area. Just a couple short blocks to downtown Yamhill and minutes to world class vineyards, Newberg, Mac, & Carlton." "Wonderful 3 bedroom, 2 bathroom ranch on an oversized lot in the heart of WINE COUNTRY!...Imagine yourself sitting on the patio in your private backyard with lots of room to kick back after a day at work or playing...This home will be great for entertaining your quest. The 9X20 shop has many possibilities. It could be converted to ADU and or guest quarters. Bring your imagination."